What Is Shiseido Benefiance Neck Contour Treatment? Shiseido Benefiance Neck Contour Treatment is a rejuvenating neck cream that focuses on promoting collagen stimulation in order to minimize the formation of wrinkles. Benefiance Concentrated Neck Contour Treatment is sold through both the official Shiseido product website and many other online retailers. 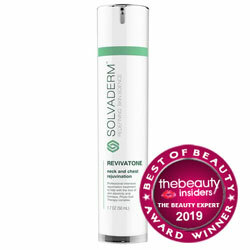 This neck cream uses plant extracts to make up the active ingredients in its patented Anti-Wrinkle System. Promised effects of Shiseido’s neck cream include added radiance and firmness to neck and décolleté skin. Benefiance Concentrated Neck Contour Treatment is described as a neck cream that offers benefits to surface layer skin cells while also penetrating to deeper layers in order to create lasting change. Benefiance Concentrated Neck Contour Treatment uses chlorella and other plant extracts to provide the promised anti-wrinkle benefits of this neck cream. Other ingredients in Shiseido’s neck cream formula include amino acids like Hydroxyproline that helps retain the natural binding properties of skin cells, causing them to adhere strongly to one another (an effect which goes against the natural process of aging). This neck cream also uses a specially patented “Firm Support Formula” which provides almost an instant smoothing and strengthening effect on surface layer skin cells. While no complete product formula could be located online for Benefiance Concentrated Neck Contour Treatment, abbreviated product descriptions note that also contains extracts from fennel and witch hazel; this cream also includes Natto gum. The price for this neck cream varies, depending upon the specific retailer. 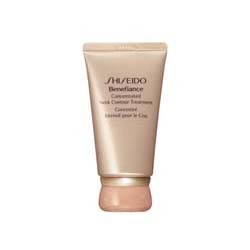 If purchased through the official Shiseido product website, Benefiance Concentrated Neck Contour Treatment costs $52 per 1.8oz bottle of cream. What Are The Advantages Of Shiseido Benefiance Concentrated Neck Contour Treatment? This cream is produced by a well-known cosmetic company. Benefiance Concentrated Neck Contour Treatment is sold through various retailers, including its own brand’s official website. The official website for this neck cream provides information about the promised effects of some of the main active ingredients in this product. What Are The Disadvantages Of Shiseido Benefiance Concentrated Neck Contour Treatment? There are no free sample trials of Benefiance Concentrated Neck Contour Treatment currently offered. Not all retailers sell this neck cream with a satisfaction guarantee. The complete list of ingredients is not featured online. There are no user reviews for this cream. Shiseido Neck Cream The claims about this the benefits of this neck cream simply do not have enough support from external sources in order to justify a recommendation. There are no cited clinical studies or user reviews for Benefiance Concentrated Neck Contour Treatment. Additionally, a complete list of ingredients is not featured online, which makes it difficult to determine its safety for individuals with sensitive skin.